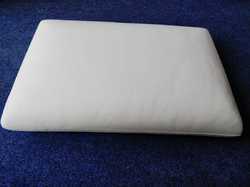 White PU Latex Pillow, Size: 16x24x4"
We bring forth our vast industrial experience and expertise in this business, involved in offering high quality range of PU Foam Pillow. Made from pure & soft PU Foam, these pillows provide an ideal support to the neckline. To give a chic & clean look these pillows are covered with white cotton covers. All sizes medium, large & extralarge sizes are available.